Image is everything for football’s ‘King of Bling’ Cristiano Ronaldo who has been spotted about town flashing a jewel encrusted timepiece that would likely put a dent into even in his substantial wallet. The watch is a Jacob and Company limited edition H24 with a total diamond weight of 15.25 cts and an retail price of nearly £100,000. However, despite being able to afford the ostentatious accessory following the renewal of his Real Madrid contract earning him around £288,000 per week, the world’s most image conscious player is unlikely to have paid the full price – since he is the new face of the luxury watchmakers. 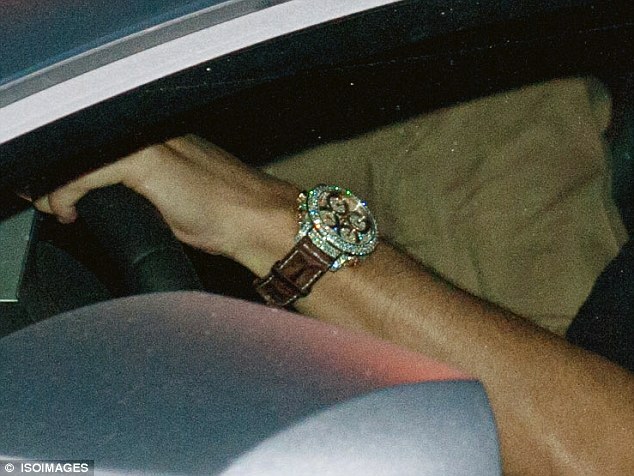 The Portuguese was seen leaving a Madrid restaurant wearing a watch that costs more than most cars before stepping into his Lamborghini Aventador – a car worth more than most houses. ‘I’ve been a customer and fan of the brand for a long time so it is a natural fit. I always used Jacob watches, even before I knew Jacob,” said Ronaldo, referring to Jacob Arabo, the founder of the company. The Portuguese recently starred in a high-profile advertising campaign to complete the relaunch of the company. Ronaldo who has also fronted campaigns for Emporio Armani and Armani Jeans, Nike and Pepe Jeans said he was comfortable in front of the camera – to the surprise of absolutely no one. “I always try to do my best on-set, as I do on-field,” said Ronaldo during the photo shoot in Madrid. The 28-year-old has also been recently seen sweating in a tuxedo on the red carpet for Jacob & Co.’s gala event in Monte Carlo.